So we have arrived back to the 100 + temperatures. The Saturday after we came home I taught the Christmas in July card class at Felicia's Scrapbooks. The class was popular and has been put on the calendar for a second run at the end of August. Ten Christmas cards was a lot to get ready for but everyone had a good time so it was worth it! I also just finished swapping out the Christmas in July tag swap I hosted on The Papercrafts website. 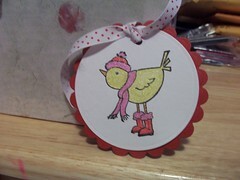 This is the tag I created for the swap.